Merciless and brave beyond compare. Shaking the earth to its very ends. Unblinking and steadfast in every way. And banishes all fear from the soul. The sword rings out in song. Nor feel that they owe another. The soul worries about nothing at all. Such a day has only been seen in dreams. His sleep is racked by thoughts unseemly. To the darkened brow of deepest night! Are they being set free! Seeking home in their own nest. By the banks of the five great streams. 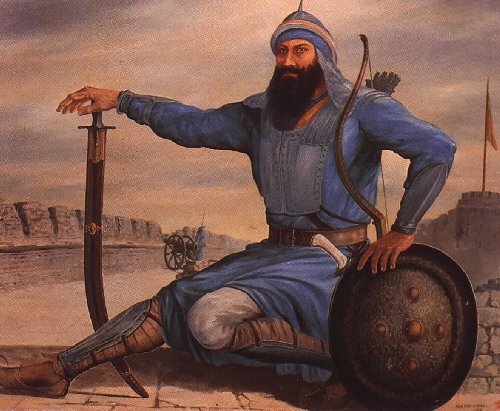 The original poem by Tagore was called Bandi Veer or the Captive Brave and described the exploits of Sardar Banda Singh Bahadur, who was blinded and maimed before being put to death by the Mughals in 1716. While he had his sight, his four year old son was put to death while on his lap and the Mughals tried to force him to eat the child’s flesh. Death came from red hot pincers and the executioner’s axe. Seven hundred other Sikhs were put to death as well. Alakh Niranjan was a cry that came from Guru Gorakshnath. 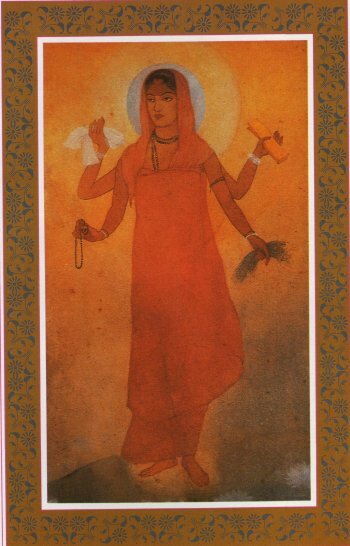 It meant the god without recognizable form or Nirguna Brahma, a concept embedded in the Upanishads. This entry was posted on August 12, 2015, in Katha, Nationalism, Rabindranath Tagore's poetry and tagged 1716, বন্দী বীর, Bandi Veer, Sikh sacrifice. Hail this pure, sunbathed earth, mother of our fathers and mothers. Your forehead kisses the sky, the Himalayas a crown of white upon it. So many beliefs, poems and stories were heard first in your forests. Your rivers carry the sacred milk of kindness wherever they flow. Score: Sarala Devi, his niece. This entry was posted on August 15, 2014, in Nationalism, Rabindrasangeet and tagged অয়ি ভুবনমনোমোহিনী, মা, Hail mother who has enchanted the world, Hemanta Kumar Mukherjee. Hail my motherland, today in this gathering, listen to this song of mine. That I bring to you as a joyous offering. I bring all that is best to present to you. We might not have plates of gold nor enough food. Yet I bring plates of young leaves filled with whatever I have. But I will shed my poverty in exchange for the very dust at your feet. And accept your precious boon in these leaves. You are no king, great sage, for you are dearest to my heart. I will cast off these rags of mine and cover myself in your robes. Your wealth is hidden in want, in silence are sheathed. Your fiery sermons – that is what we crave. I will cast off this disguise and cover myself in your robes. Give us the word that drives all fear, give us the mantra to defeat all sorrow. Give us the words that give immortality, give us a new life to live. Take us back to that life of freedom and spirit, so that we may fill our souls. Give us those words that give us the strength to face death and conquer all fear.